Exceptionally Rare & Historic Blackfeet War Chief’s Shirt & Leggings c.1830s | Skinner Inc.
During 1865-67, Captain Reymond Hervey de Montmorency canoed west from Montreal, exploring the Lake Huron area for the British army. In the process, he collected one of the finest examples of a Blackfeet war chief’s shirt and leggings form the 1830s, which remained in his family’s possession for over 140 years. Skinner, Inc. is proud to present this historic example of Blackfeet artistry, marking the first time a complete suit from this period has been available for acquisition in North America in over a century. The sheepskin war shirt features more than 40 painted color figures depicting its wearers’ war exploits. It is further decorated with embroidery, back and chest rosettes of porcupine quillwork, and locks of human and horse hair. The antelope leggings are trimmed with human and horse hair and 53 black painted horizontal stripes. These stripes indicate that this ensemble was worn in 53 war expeditions, most likely beginning in the early 1820s. Fewer than 20 complete suits from this period have been collected worldwide. The only other comparable example in North America of a Blackfeet war shirt from this period is in the collection of the National Museum of the American Indian in Washington, D.C.
For more on the provenance, artistry, and cultural and historical significance of this ensemble read the full essay by scholar Mike Cowdrey. 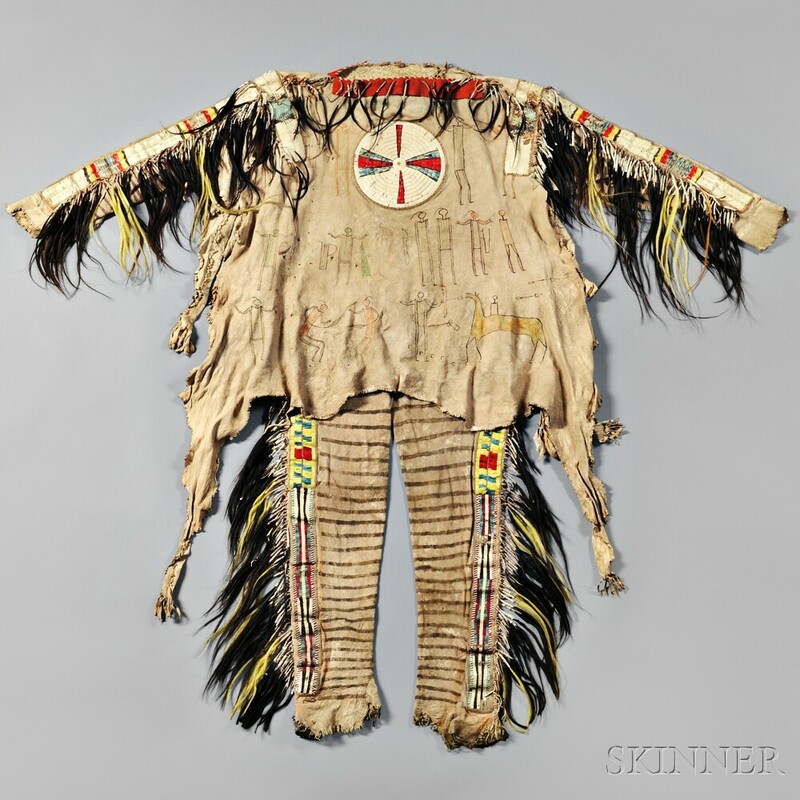 The Montmorency suit will be presented in Skinner’s American Indian & Ethnographic Art auction on Friday, May 6, 2016. This entry was posted in Blog and tagged antelope leggings, auction, Blackfeet, Blackfeet war shirt, Captain Reymond Hervey de Montmorency, embroidery, horse hair, painted figures, porcupine quillwork, rosettes, sheepskin, skinner, war chief by Skinner. Bookmark the permalink.